Thank you to all who attended the event, and especially our members who made it all possible. 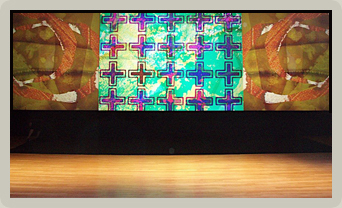 The Long Now Foundation presented the North American Premiere of Brian Eno's 77 Million Paintings for 3 days at the Yerba Buena Center for the Arts in San Francisco. Friday and Saturday evening were absolutely packed with nearly 800 and 1000 attendees, respectfully. Sunday was the Long Now members evening. We were a bit surprised to find that the big crowd for each evening came right at the opening time, leaving the late night crowd with the installation much to themselves. Many people stayed for hours with the installation; it was an incredible sight to see 400 bodies laid out in complete silence, bathed in the glow of 48,000 lumens of high definition imagery. The Sunday evening members event was a nice change of pace with a few hundred less people who were as much into mingling as seeing the piece, giving the party area and the installation a nice balance of people. 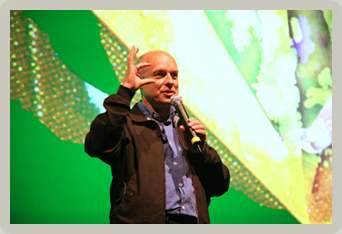 Brian Eno was also able to join us for this final evening and say a few words about how this piece relates to Long Now. Long Now would love to thank all of our new members for whom this event was arranged, Brian Eno for allowing us to put it on, Obscura Digital and AVPS for their advice, support and incredible projection gear, the unstoppable Rock Star Bartenders, Yerba Buena Center For the Arts, all of our staff and volunteers, and our local 16 stage-hands for putting it all together. Conceived by Brian Eno as "visual music", his latest artwork 77 Million Paintings is a constantly evolving sound and imagescape which continues his exploration into light as an artist's medium and the aesthetic possibilities of "generative software". He first created 77 Million Paintings to bring art to the increasing number of flat panel TVs and monitors that often sit darkened and underutilized. Now Eno is also showing large installations of this work, recently at the Venice Bienniale and Milan Triennale, and in Tokyo, London and South Africa. 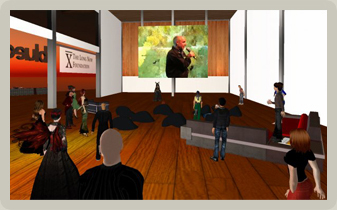 The installation at Yerba Buena Center for the Arts was the North American Premiere of his work.